Errol: We would always argue about which songs may be more accessible to people. In hindsight, it probably didn’t matter. It doesn’t really matter; some of us sing along regardless! Then we should get you on stage! Double Rainbow??! What does it mean?!?!?!? 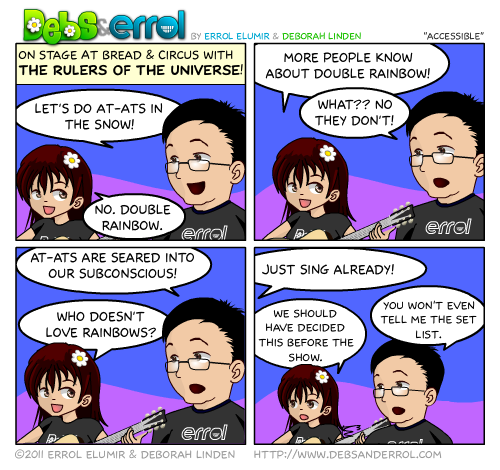 Sad to say Errol, but “Double Rainbow” wins. I think that, if you showed people a picture of an AT-AT, they’d say “Hey, I know what that is,” but if you said “Do you know what an AT-AT is?” they’ll look at you weird. When you first sang that AT-AT song at Imperial Pub I had NO idea what the heck you were yammering about. It only dawned me later you were singing about Star Wars… BTW Empire Strikes Back was my first Star Wars film I saw as a kid and still one of my favourite films of all time. Strange as it many sound, I know a decent number of folk who’ve NEVER seen a single Star Wars film. Oh, my wife is one of those folks. Correction, she’s seen episode one because I dragged her to it. Poor girl.